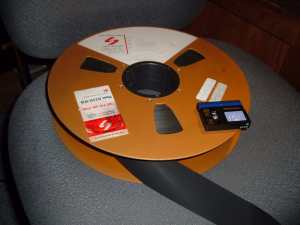 From Page2Pixel» Blog Archive » An impending quad tape dilemna? An impending quad tape dilemna? An interesting post and ensuing discussion this weekend occurred on the Association of Moving Image Archivists listserv. Jim Wheeler reports on what could be an ominous sign for Quadruplex and 1-inch Video tape archives around the world. Video Magnetics, Inc., one of the last vendors that services the Quad and 1-inch tape machines, appears to be hitting hard times. Video Magnetics is the only company that I am aware of that rebuilds 1 inch and 2 inch video heads. Recently, I chatted with the owner (Tony Korte) and he has laid off most of his people. Tony had 45 employees a few years ago and now has five. He will probably have to shut down next year. There are currently no vendors producing 2-inch tape machines, with the last widely-produced AMPEX and RCA models being introduced in the late 1970s. Even so, is reign spanned three decades, having been introduced in 1956, and used by broadcasting agencies well into the 1980s. Without a doubt, lots of valuable television history exists on Quad tape. Quad slowly began to be supplanted by 1-inch tape in the mid 1970s, with players being made by NEC as late as 1988. As Wheeler notes, without a knowledgeable vendor servicing the read/write heads for the existing, aging fleet of Quad and 1-inch players, the ability to retrieve the content off the countless reels of tape out there will be lost at an unpredictable rate. Video Magnetics has been around since 1976. According to their website, they began at that point selling refurbished Quad video heads for Ampex and RCA video recorders. As late as 2006, the company added the ability to service more recent-vintage Sony Betacam SX gear, in addition to modern DVCPRO format VTRs.